The launch of the Samsung Note 8 was one of the most highly anticipated releases of 2017; where the Note 7 had failed, the Samsung Note 8 has surpassed all expectations. Select your desired options to find the best Samsung Galaxy Note 8 deals for you. 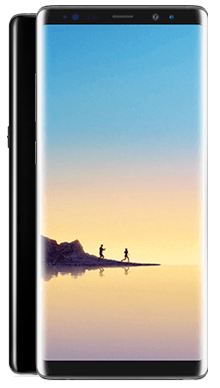 When Samsung released the Note 8 in 2017 it was easily one of the most eagerly anticipated phones of the year. Samsung loyalists were beyond excited and new customers were intrigued. 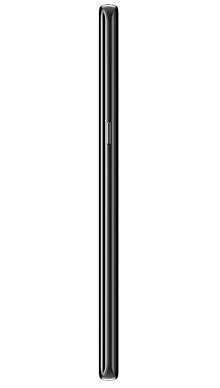 And rightly so; the Note 8 is powerful, intelligent and extremely technologically advanced - it raised the bar. There was, of course, the shadow of the scandal of the Samsung Galaxy Note 7 hanging over the new launch; the pressure really was on the manufacturer to deliver their best handset yet. Whether you’re looking for a handset for personal or professional use, it is a stellar choice. It is beautifully designed and uses some of Samsung’s best technology yet. 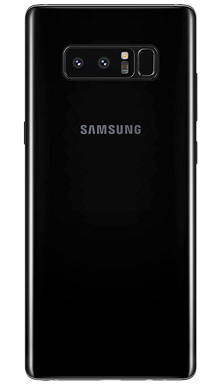 In true Samsung form, the brand has provided a stunningly designed phone which retains the professional feel that we’ve come to expect from Galaxy Note handsets. As is typical of a Samsung Galaxy Note, this is a tall handset with a big screen, making it difficult to use with only one hand. The aforementioned screen is an impressive 6.3 inches of Super AMOLED technology and is reinforced with Gorilla Glass 5 for added durability. With a 1440 x 2960 resolution, the Note 8 delivers a stunning viewing experience with vivid colours, rich contrast and well-balanced saturation. Critics had previously raved about the sound quality on the S8 and S8 Plus handsets, and thankfully the Note 8 retains that impressive quality. With a rich and full-bodied sound quality, the Samsung Galaxy Note 8 delivers a fantastic audio experience which handles a variety of music files and instruments extremely well. To further enhance this impressive audio quality, the Note 8 comes with a decent pair of AKG headphones so that users are able to enjoy their favourite music straight away. A 12MP rear camera with dual lenses and live focus ensures that you’ll be snapping amazing photos on the go. There 2 x optical zoom to deliver fantastic photos every time, with sharp details and well-balanced colours. There’s a variety of different modes and features that you can apply to your photos, so your family and friends will be thinking you are a professional photographer in no time! As if that wasn’t enough the Note 8 also packs an 8MP front camera so you can always be sure you’re selfies are on point. The familiar S Pen has been improved with extra sensitivity for an ultra-responsive experience, plus the Note 8 is fully compatible with the revolutionary Samsung DeX - meaning you can quite literally put your phone on your laptop. Beyond the camera capabilities the Note 8 has a 64GB internal memory that can be expanded to 256GB, as well as 6GB of RAM, so you never need to worry about space; you can store all the apps, music and files you desire. The Note 8 runs on a mighty octa-core Exynos 8895 processor to deliver an exceptionally responsive smartphone experience with no delay, but you wouldn’t expect anything less from a Samsung Note handset. There’s also a highly impressive 3300mAh battery that is compatible with convenient wireless charging as well as Quick Charge 2.0 for a fast and effective boost whenever needed. Here at Metrofone, we’re dedicated to finding the very best smartphone deals for our customers. 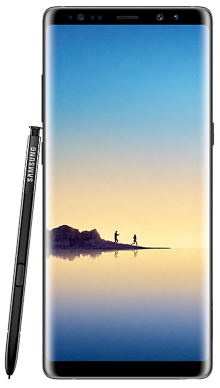 Whether its data, minutes, or bonus extras that you’re looking for to go along with the Samsung Galaxy Note 8, we’re guaranteed to have the perfect deal for you. 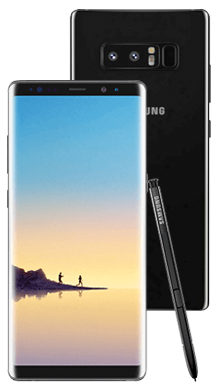 We partner exclusively with EE to bring you the very best deals our team can secure; they work round the clock to ensure that our customers receive the best EE Samsung Galaxy Note 8 offers. EE is the UK’s leading mobile phone network, so we know that our customers will receive the best service and connection regardless of where they are. If you are looking to get your hands on the Samsung Galaxy Note 8, but you want a little more information, or if you’d like to discuss a deal in more detail, then why not call our dedicated customer service team today on 0333 900 1144 for all of the information you might need? They’ll be happy to listen and secure you the very best EE Samsung Galaxy Note 8 deal. Metrofone ‘Nearly New’ mobile phones are previous customers' 14 day returns, which we are unable to sell as a new device. The only difference is the price! What is the Metrofone Guarantee? We are confident you will love our ‘Nearly New’ products. If for any reason you are unhappy, we offer a like for like replacement free of charge. Terms apply, see our FAQ's for more details. We take great care to ensure full customer peace of mind if you purchase any of our ‘Nearly New’ products. In some cases products might have slight damage to the box or a very minor scratch, but the overall quality of the product should be as new.